Online News and Resource about Architecture, India and World Wide! - In crafting a modern setting within a historic context, the Irish firm of Douglas Wallace Architects has struck a delicate balance between respectful homage to the past and a stylish adventure into the future. In the new Habitat store in Dublin, they have converted an 18th-century Bank of Ireland and a 1960s office building into a large retail establishment for the city center. Working with concept architect Patrick Mellett of Paris, Douglas Wallace has transformed two adjacent buildings into offices and 22,000 square feet (2000 square meters) of retail space for the home furnishings franchise, one of the largest retail units to.............Read on! - A series of explosions shook New Delhi on Saturday, tearing through markets jammed with shoppers ahead of an upcoming Hindu festival- DIWALI. 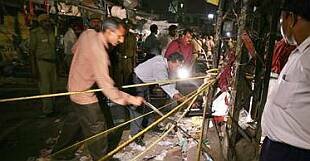 As many as 20 people have been killed in an explosion in Sarojini Nagar market and 15 others have reportedly been killed in Paharganj.Red alert declared in Delhi following explosions in Paharganj, Sarojini Nagar market and Govindpuri.Most of those injured or killed in the explosions were ordinary people out shopping in the festival season. According to latest reports, RDX was used in the blasts.Prime Minister Manmohan Singh, in a statement from Kolkata said the blasts are a clear case of terrorism. - A COMPETITION to design a museum which will never be built is exercising the minds of Manchester architects. The contest to come up with plans for the Manchester Letherium has become one of the greatest challenges to the world's architects. Some have spent days and nights sweating over their vision of the Letherium, which is the name given to the imaginary museum `proposed' for the junction of Princess Street and Whitworth Street.The winner will be announced on April Fools' Day - which is appropriate, as the Letherium will never be built. ...............................Read on!! - After six highly successful conferences in Toronto, Madrid, Kuala Lumpur, London, Singapore and Bangalore, the most prominent international forum specialising in Towers and Tall Buildings will be held in Dubai. Do not miss this unique opportunity to join and share knowledge with regional and international colleagues representing the most esteemed Architects, Engineers, Land Developers, Material Specialists, Entrepreneurs and Decision-Makers at the forefront of the tall building construction industry worldwide!! - A building can outwardly but subtly express the functions it shelters and express institutional regard towards its surrounding context. An example of this is the new office building for Rijkswaterstaat Zeeland, the Department of Water Management and Transport (RWS), in Middelburg, The Netherlands. Through its many sustainability features, it shows deference to energy and water conservation and to the well being of its occupants........................Read More!! -Artcity is a celebration of contemporary visual art, architecture and design, held every September in Calgary, Canada. Artcity opens possibilities for conversations, debates and realizations about how and what artists, architects and designers do and how they see and shape the world around us. By programming underused, neglected and temporary spaces, the festival enters into environments where the public live and work, re-shaping and re-defining Calgary's - and Calgarians'- everyday landscape...........More Info! Thom Mayne has been named Pritzker Prize laureate of 2005. - This year's choice for Pritzker Prize laureate is Los Angeles architect Thom Mayne. He is known for breaking through traditional bounds of forms and materials, and his work has been chosen for numerous awards during his three-decade career. Mayne is principal of Morphosis, meaning "manner of formation." The firm's recent built works to capture media attention include the Diamond Ranch High School, the Caltrans District 7 Headquarters, and the Dr. Theodore T. Alexander, Jr. Science Center School. He is currently working on a project in association with New York City's bid for the 2012 Olympics. Mayne.................Read More! - Bangladeshi architect Md Rafiq Azam has recently got the “Focus Countries Commendation Award-2003” of JK Cement Group, India for his project — Karim Residence — at Gulshan in the city. Rafiq Azam also won the same award in 1997 and 1999, said a press release. Md Rafiq Azam was also among the 23 finalists from around the world in the “Aga Khan Award for Architecture-2004” for his multi-family housing project in Khazedewan, Lalbagh. The other selected projects of Rafiq Azam..........................Read More! Mumbai's Shivaji Terminus in UNESCO'S heritage list!! - Mumbai's Chhattrapati Shivaji Terminus has been included in the UNESCO's World Heritage List.A certificate regarding this was given by the UNESCO's officer-in-charge (New Delhi) to the Chairman of Railway Board, which has been preserving the monument, at a ceremony in New Delhi on Wednesday.The UNESCO included the structure,...................Read More! - According to Thestarpress.com, Ball State University architecture students helping to rebuild a Sri Lankan fishing village with their bare hands. While staying in the tiny Sri Lankan fishing village of Kalametiya, more than 20 Ball State students who participated in an architecture field study program this semester helped families construct permanent homes in place of the tents they'd been living in since December's deadly tsunami ravaged the island nation. Well, we all appreciate the efforts of those, who are directly or indirectly helping in relief and rebuilding process of disaster struck areas. We also appreciate people to donate generously for Tsunami relief funds. - Space Agency is a committee of The Vancouver League for Studies in Architecture and the Environment. Founded in 1979, The Vancouver League is a non-profit organization and dedicated to the promotion of architecture and design. Frontierspace is an open international design competition in the city of Vancouver organized by the spaceAgency. The frontier is a border that separates the known and accepted from the unknown; it is the leading edge; it is a space where new ideas can be tested. This competition aims to generate innovative design proposals to re-think an existing space in the city....................Read More! -LEDs are everywhere, and not just in traffic lights and digital alarm clocks where they started several decades ago. LEDs, short for light emitting diodes, have been steadily making their way into architectural applications around the world. Until recently, LEDs were considered impractical for widespread use in large environments but the technology has improved dramatically—they’re smaller and brighter, use less power, can be computer controlled, and cycle through all the colors of the rainbow—enticing more and more architects and designers to integrate them in their work.Many manufacturers (even those that only recently incorporated the technology into their lines) have now made LEDs, if not a.............................Read More! CULTURAL INSTITUTION "DAKSHINA CHITRA "
- DakshinaChitra is a unique Heritage Centre located on the east coast road in Muttukadu on the way to Mahabalipuram which offers the visitor an unforgettable & authentic insight into the lifestyles of the diverse peoples of South India. Traditional craftspersons & folk artists work & perform in the reconstructed period settings of 19th century streets, homes & workshop-spaces in the TamilNadu & Kerala sections. These are presently open to the public. Enter the TamilNadu section through a majestic carved wooden doorway..............Read More! - Centre for Science and Environment (CSE) has launched its training programme on 'Urban Rainwater Harvesting,' and I would like to introduce you to its prime components. This initiative is a part of the Anil Agarwal Green College, that is being set up presently.For more than two decades now, the Centre for Science and Environment (CSE) has worked to spread awareness about the immense relevance of rainwater harvesting. Our primary...................More! - We may live in a new age, but we still clamor for old world styling in our homes. Today’s interior design trends reflect our desire for looks that say “handcrafted” yet perform “high tech.” Laminate flooring is an ideal marriage of the modern homeowner’s love of authentic details and need for maximum durability. “Homeowners today can have the timeless appeal of wood’s look in laminate flooring products that offer superior durability, clean easily -- and install quickly, without glue,” explains Claes Wennerth, president of laminate flooring manufacturer, Alloc, Inc. located in Racine, Wis. “This dual personality..................Read More!! - Straw bale walls, photovoltaic cells, recycled textiles, and furniture featuring locally harvested wood are some features that will be a part of the new Kennedy Commons building on SCU's Mission campus. San Francisco architectural firm of Kaplan Mclaughlin Diaz (KMD) has been commissioned to design the new building, which will be the ultimate "green" building on campus and an example of SCU's commitment to stewardship of the ..........................Read More! Winning Design For National AIDS Memorial !! - A haunting design by two New York architects has won a competition to create a centerpiece for the National AIDS Memorial Grove. It's a seven-acre garden in San Francisco's Golden Gate Park that is the only federally recognized AIDS memorial in the United States. The winning entry is called "Living Memorial." Designed by Janette Kim and Chloe.............More! - From the early days of Auroville, in the 1970’s, different experiments have been made with earth building, with mixed results. The creation of the former Auroville Building Centre/Earth Unit in 1989, and the construction of the Visitors’ Centre, started a new era in earthen architecture.This Visitors’ Centre of 1200 m² was granted the “Hassan Fathy Award for Architecture for the Poor” in 1992. Built of compressed stabilised earth blocks, it demonstrated the potential of stabilised earth as a quality building material.Since then, the value of earth as a building material has been acknowledged for its economic advantage, as well as its comfort and quality, which promotes indigenous and sustainable development. Today, Auroville can show a wide variety of earthen projects: public buildings, schools, apartments and individual houses.Most of the projects...............................Read More! - Focusing on the ancient and medieval temples of India, this section is designed as a tutorial on the tradition of Indian temple construction. Readers are encouraged to begin with a overview of technical terms and make use of the numerous cross ................................Read More! - Thom Mayne, FAIA, who founded his now internationally renowned firm Morphosis in 1972, has been chosen as the 2005 Laureate of the Pritzker Architecture Prize. This award celebrates a three-decade career in which the Los Angeles -based architect has garnered 54 national, state, and local AIA Awards as well as numerous other honors around the world..................The firm also is looking forward to completing the New Academic Building for The Cooper Union for the Advancement of Science and Art and the NYC2012 Olympic Village, a project in association with the Big Apple’s bid for the 2012 Olympics. Morphosis also .................Read More! - HONG KONG (AFX) - As Hong Kong seeks a spectacular new landmark to add to its famous skyline, the city has become a design battleground where the world's greatest architects are striving to make their mark with a visionary arts and performance center. American Frank Gehry and Argentinean Cesar Pelli were both in the southern Chinese enclave last week to marshal their forces in a bidding war for a project already designed, in terms of outline, by Britain's Lord Norman Foster. The three heavyweights, who between them have created some of the world's most striking modern structures, are keen not only for the riches the 40-hectare West Kowloon Cultural District will offer the winner, they want a piece of the prestige it is expected to.............................More on BattleGround! - This page provides a quick history of architecture in the Western world, from prehistoric megaliths to modernist skyscrapers. Follow the links to find articles and photos for each period and style. Please note that architecture is a fluid art. Architectural styles do not start and stop at precise times, and the dates.....................................More! - Deconstruction or deconstructivism architecture," according to Bernard Tschumi words at the 1988 Frist international symposium on deconstruction in London. It is looking for "the between" According to Peter Eisenman at the same symposium, architects who fracture are merly illustrative; they are not challenging an preconceptions. While the theory the "new way of seeing" for architects and academics may be viewed as a decadence it more importantly offered an alternative incluence to the increasing banality of postmodern formality.The resulting buildings actually seem to fit the word - dismantled, fractured dissasmblages, with...............................Read More! - In a world with millions of refugees, numerous war zones and huge areas devastated by natural disaster, aid agencies and militaries have long needed a way to quickly erect shelters on demand. Soon, there will be such a method. A pair of engineers in London have come up with a "building in a bag" -- a sack of cement-impregnated fabric. To erect the structure..........More! 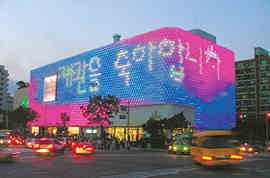 - Thom Mayne, a daringly progressive architect based in Los Angeles, will receive the 2005 Pritzker Architecture Prize. The award, which carries a $100,000 grant, is considered the design world's equivalent to the Nobel Prize. 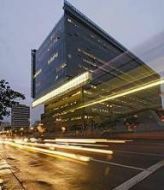 Mayne, 61, leads the innovative firm Morphosis, which captured public and media attention for the Caltrans District 7 Headquarters and the Science Education Resource Center/Science Center School, both completed last year in Los Angeles. The Caltrans building.........................Read More! Irish architects -After he received his primary degree, he spent a year at Imperial College in London before joining Ove Arup and Partners in 1956 to work on the Sydney Opera House. 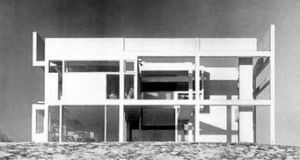 At Arups he was part of a small team which worked for three years to figure out a way to built Utzon's shells. After three years working on the project in London, he moved to Sydney to be assistant engineer to Ian MacKenzie. After one month MacKenzie fell ill and was hospitalised, leaving Rice in total charge. At the age of 28, he was resident engineer on one of the world's most recognisable buildings. He was responsible ..............................Read More about Peter Rice.